Picture taken by Denise Khng. This story was written by Denise Khng, Literature + USP, Year 4. It was a Saturday, when the tourist crowds started filling in, and you were walking beside me, holding onto the chocolate-covered crepe I bought you from the pushcart stall by the bridge. We had to walk really fast because we had to get back to the hotel before Mum and Dad woke up. wanted to stop and look but I told you no; we’d caught the sunrise and that was all that mattered. I remember how you gaped at the clouds above the city, how you tried to run through a flock of pigeons that flew up in the air around you like a grey hurricane, how you left a warm handprint on the frosted glass of that store window. I remember your shadow. I thought it looked like Peter Pan’s because of that cape you were wearing. But instead of flying, you were walking. Walking really, really fast. I kept track of your shadow. It disappeared and reappeared, past the dark stretched lines of lamp posts and trees, like the sound of your footsteps hurrying to catch up with me. It was when we cut through the park that it happened. That morning, amidst the pink dawn of new dreams and fresh hope, the sound of your voice disappeared at 8.17am behind the grandstand of white museums and yellow trees. You’d disappeared into the light that fell through a canopy of leaves, as if you were never with me in the first place. Somewhere across the street, the sign draping down the Musée d’Orsay said Edward Hopper – the pertinent crowd-pleaser to a host of travellers who knew no better. Like the Chop Suey ladies, every face that passed me looked identical – weary, middle-aged, oblivious. I yelled your name. All I got back was the chill of the wind in my face and the blank stares of the crowd. I imagined you following one of them by mistake. I imagined you being led down the steps and into the unending tunnel of a Metro, getting on a train, being locked in by the doors, your face speeding by as a distant reflection in the glass. I imagined your possible panic; the fear illuminating your face when you realised you’d lost sight of me, the great terror that comes with the fact that I haven’t yet found you. I circled back to the store window where I thought your handprint was – anything to remind me that you were with me that morning. I couldn’t find it. After a while, the streets all looked the same. Your voice rang in my ear; the swoon, the surprise, the eagerness, the six-year-old’s pitch decipherable amidst the incoherent smoker’s drone everybody else seemed to share – the “thank you” you bestowed upon me for the crepe, sounding just like an early Christmas present. I think I might have welled up sometime, when I walked past the bridge for the umpteenth time. If anything, I was glad you didn’t see that. I got back to the hotel and told Mum and Dad you were gone. They got a search party out within an hour. But like me, they ran and drove in circles. The tiny red light on the roof of the black police car screamed red angst, red panic, red dreams in which your features drowned. It bludgeoned the hope that you were safe and sound and playing hide-and-seek in a city that was too large a playground for you. 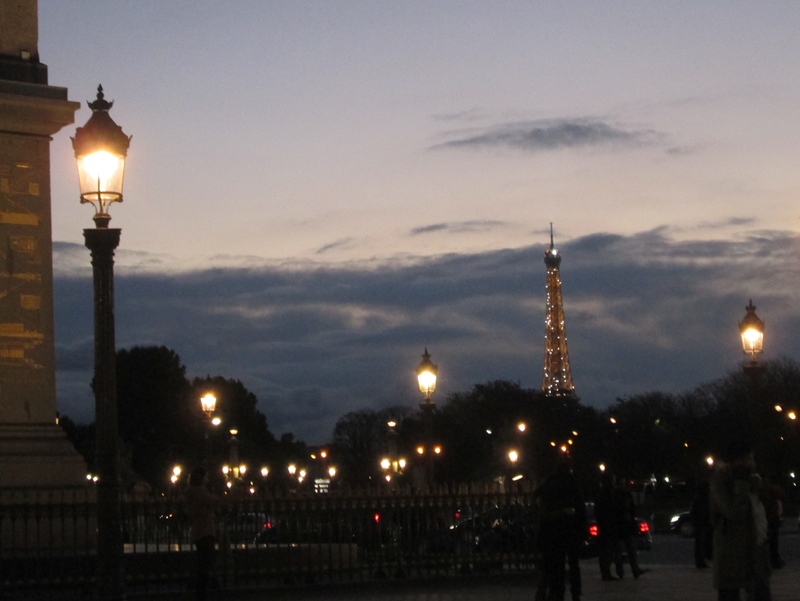 When darkness fell, the lights on the Eiffel Tower glittered for a summer long gone. Sparkling like one of those trinkets come to life. You know, I’ll get you all the trinkets you want if you just reappear. I’ll stop with you and tell you to take your time in picking out one you liked. I’ll wait for you. Our flight was cancelled that evening. Under the private cloak of night, I wandered to a church I couldn’t name. Its doors were locked, its divinity inaccessible to me. I, transgressor of the moment, undeserving of all your previous unblemished admiration. I imagined you being utterly disappointed with me, harbouring a resentment so deep it prevents you from even wanting to be found by me or Mum or Dad. I sat under the arched doorway where the gargoyles looked like they were mauling a cherub. Then I bolted. Past the bridge, past the tower, past the closed-off park. You were frozen somewhere, cast into one of those child statues guarding the bridge to the Invalides. But I couldn’t spot you. Everyone else thinks you’ve been taken. Or that you wandered off, fell into the water, got swept away. All speculation. I see your face on that Discovery Channel documentary and the headline news. You’re smiling at me – the milky six-year-old grin that would probably have changed by now. It was a Saturday, when the sunrise was fraught with romantic normalcy, and your shadow was still there beside me, flitting past the dappled streaks of sunlight that were cast on the ground. I was walking really fast. I thought I kept track of your caped shadow. But it got lost in the throng of tourists filling in, mauled by the dark mass of shadow crowd and trees. I should have turned around the instant your footsteps stopped. I should have listened for the sound of your voice. When dawn broke the next day, I walked past a window with a faint smear on the glass. I wondered if it was your handprint those hours ago, but the store display looked unfamiliar. I hope it was yours. I think it might have been. It disappeared completely by evening. I wish I could have framed it. Mum and Dad lingered in the city for a month but I stayed an extra week after they left, and took the seven-hour flight back home on my own. They’ve stopped looking for you. They’re crazy. I haven’t spoken properly to them since they pulled your ad from the papers. It’s been two years since your last ad was printed. I know you’re still out there. That’s why I’m back in Paris. For you. I bought you a trinket, just so you know. I get you a new one every year that I’m back here. I walk past the same store window too, but of course, there’s no longer a trace of what I think was your handprint. Along the bridge where the Seine runs through, I watch the streetlamps flicker on as the sky deepens in blue and the air grows cold and still. There’s a busy pushcart stall across me, bright against the shadow of an unused carousel. Bright, just like the sudden empire of lights stretching across the horizon. You’ve become a part of this city. Absorbed into it like how your curious gaze had taken in the pink cloud that morning. But it’s time to go home now, little bro.